While Friday was quite a day for those involved in the entire Trump/Russia saga, the overwhelming number of documents presented late in the afternoon likely has left many Americans feeling a bit confused. President Trump’s tweet late yesterday, implying that the filings from both the special counsel’s office and the Southern District of New York “Totally clears the President,” could not be further from the truth. In fact all three documents, the two Cohen sentencing memorandums and the Manafort sentencing memorandum, are quite damning to Mr. Trump’s current narrative that he’s innocent of all crimes. The biggest piece of information came in the 40-page sentencing memorandum for Michael Cohen from the Southern District of New York. The memo clearly stated that Cohen admitted that ‘Individuals-1,’ who we now know is Donald Trump, directed him to commit two felony counts of campaign finance violations when he paid two women that Trump had affairs with, Stormy Daniels and Karen McDougal, in order to silence them. For those unaware of the law, when a client directs his attorney to commit a felony, they too are also almost always found guilty of a felony as well. “When you look at what the prosecutors did in the Southern District of New York they allege that Donald Trump directed two campaign finance violations. These are felonies and you can infer intent by looking at a defendant’s statements,” California congressman Ted Lieu told MSNBC’s Chris Matthews last night. In the special counsel’s sentencing memorandum for Michael Cohen, they clearly indicate that Cohen’s assistance was ‘significant’ in four separate areas. One such area was his help in providing information about the outreach from a “trusted person” within the Russian Federation. This individual offered to help the Trump campaign from a political angle, while at the same time offering to help Mr. Trump from a business standpoint. While Cohen did not follow up on this offer of both “political synergy’ and business synergy, the fact that Mueller has used this information as a reason why Cohen had been a ‘significant’ help shows that it may be a key piece of evidence in the ‘Russian collusion’ part of the investigation. Finally, later in the day yesterday, the special counsel’s sentencing memorandum for Paul Manafort was released. In it was a laundry list of lies told by Trump’s former campaign manager about his interactions with the suspected Russian intel operative, Konstantin Kilimnik, and ‘senior’ Trump administration officials. The memorandum detailed the fact that Manafort had told investigators that he was no longer in communication with the Trump administration. However the special counsel alleged that they found out that he actually was communicating with the administration as late as February of 2018. This is important because it may mean that Manafort and the Trump legal teams have been coordinating their stories and perhaps their lies. If Manafort lied about multiple facts, then it may suggest that Trump also lied about the same facts, putting him in legal jeopardy as well. Questions also abound about why Manafort felt the need to lie about his interactions and meetings with Konstantin Kilimnik, a business partner of his and also a suspected Russian intel operative. 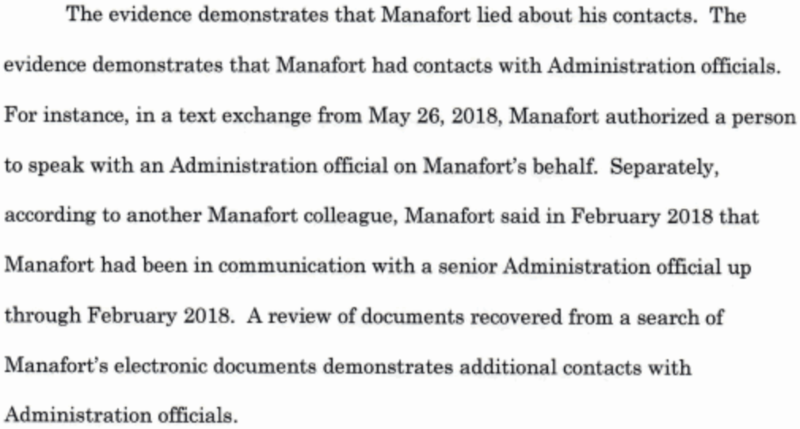 The details of these interactions have been heavily redacted, but it’s clear that Manafort, who was supposedly cooperating with investigators, didn’t cooperate when it came to a known Russian agent he was meeting with during the campaign. It is evident that these three memos do not “clear” the president like he claimed they did yesterday afternoon. Instead these memos have only helped build a case in the court of public opinion for what both the Mueller team and other investigators in the Southern District of New York are apparently working on.